I love using chicken thighs (either boneless, skinless or bone in, skin on!!) for this – they are so full of flavour – and don’t take very long to cook! 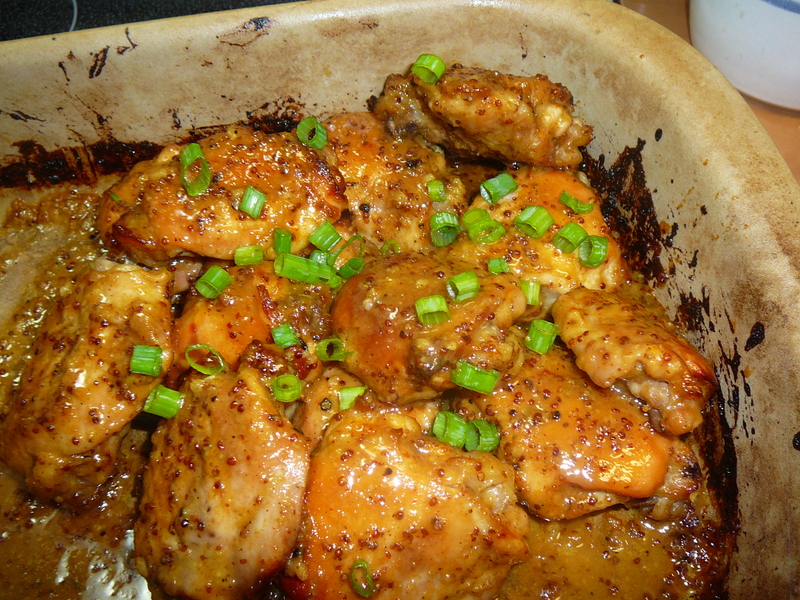 Place chicken in baking dish, and combine the rest of the ingredients in small bowl. Stir well and drizzle over chicken – rubbing and turning the chicken to coat well. Finish with bone (or under side) up. Roast for 20 minutes, turn chicken and roast for a further 20 minutes, basting with the honey mustard mixture again for the last 10 minutes. Depending on the size of the chicken thighs, they might take longer to cook. It is important for them to cook long enough to get this delicious bit of carmelization on the chicken – yum yum yum. If you have used skinless, the chicken will still get a nice roasted, browned finish to it, but if you have kept the skin on, it will be irresistible!! This entry was posted in Chicken, Recipes and tagged butter, Chicken, garlic, honey, honey mustard, mustard, roast chicken by Chatty Kathy. Bookmark the permalink. Honey and mustard really is one of those classic flavour combos, and your chicken looks delicious! Thanks -I think the little bit of lemon brightens up the flavours too – let me know what you think! This looks fantastic! I have only tried that gooey canned honey-mustard sauce back in the old days, I must gives this a try! Thanks for sharing. It is so quick and easy you won’t ever buy that product again! I love mustard and this combination of the 3 really gives it lots of flavour – let me know what you think!